Columbus Quilted Pillow - VHC Brands | P.C. Fallon Co. This Columbus quilted pillow measures 16" x 16" and is 100% cotton. 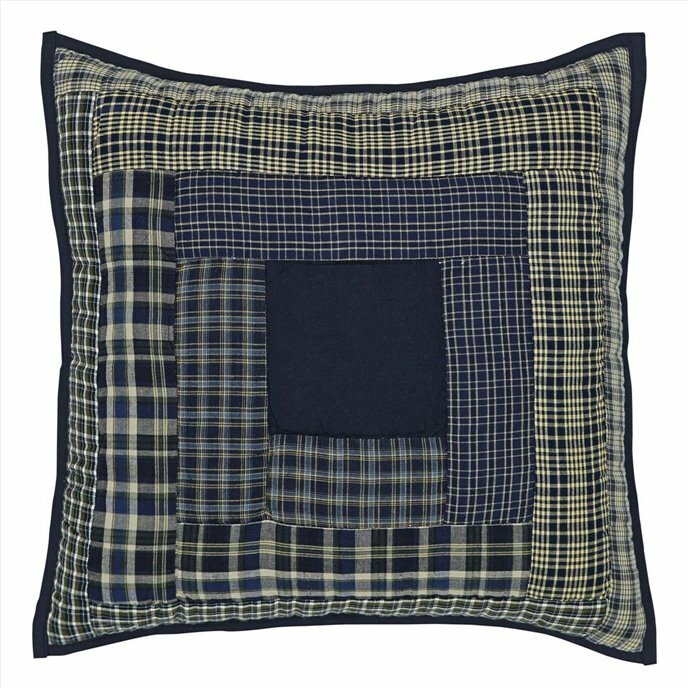 The front features a log cabin design in navy blue and green plaid fabrics. Hand quilted with "stitch in the ditch" quilting, machine pieced. Solid navy trim on edges. On the solid navy blue back, the pillow insert is concealed by a 3" overlap secured with two ties. Pillow fill is 100% polyester. This item is imported. Please note, colors may appear differently in different resolutions and on different computers. From The Victorian Heart Collection made by VHC Brands. Manufacturer's UPC code is 840528151095.